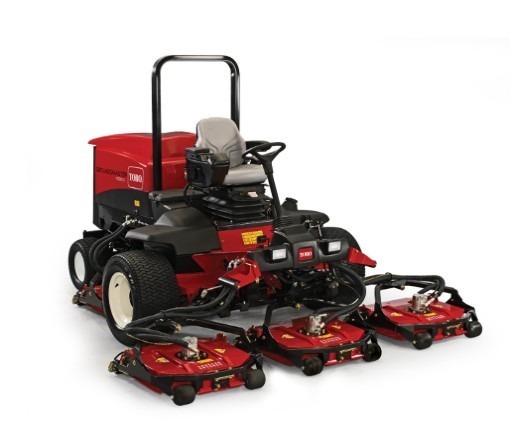 The Groundsmaster® 4500-D and 4700-D both feature a unique, parallel hydraulic traction system that assures full-time, bi-directional 4-wheel drive. Parallel hydraulic flow between front and rear wheels means that you will have 4-wheel drive assistance in turns, enabling easier trimming around objects without tire scuffing and dependable traction on hills and wet terrain. Rear rollers provide an attractive striping effect while you mow, greatly enhancing the finished look of your turf. The Contour™ Plus cutting technology takes quality of cut to a whole new level. Air inlet pockets keep the grass standing tall for the cleanest possible cut and a modified rear discharge opening disperses clippings more evenly. An optional mulching kit and optional high height of cut blade are also available. Proven rugged frame, drivetrain, and components ensure durability and long life. Heavy-duty welded steel decks and frames provide extra durability and long life. Decks can be raised or removed quickly, and enclosures can be pulled off without tools so technicians can get at everything effortlessly. The operator area of the Groundsmaster® 4500-D and 4700-D was designed to make work more comfortable with amenities like a large operator platform, multi-size beverage holder, 12-volt outlet, storage box, deluxe seat, and portable radio holder. Operators will also be pleased by the lower sound levels and the additional storage area behind the seat that’s large enough for a water cooler, trash bucket, and other items. The Kubota® 60 hp (44.7 kw) turbo-diesel liquid-cooled, 4-cylinder engine provides an abundance of power to handle the most demanding mowing conditions. The 4500-D and 4700-D are the most powerful mowers in their class, with 117 ft-lbs (158.6 N) of torque at 58 hp (43.3 kw) net and normal engine speed of 2600 RPM. The Groundsmaster® 4500-D, with a 9′ (2.7 m) width of cut, lets you mow up to 7.6 acres (3.1 hectares) per hour. With a 12.5′ (3.8 m) width of cut, the Groundsmaster® 4700-D lets you mow up to 10.5 acres (4.2 hectares) per hour, giving you a big boost in productivity.